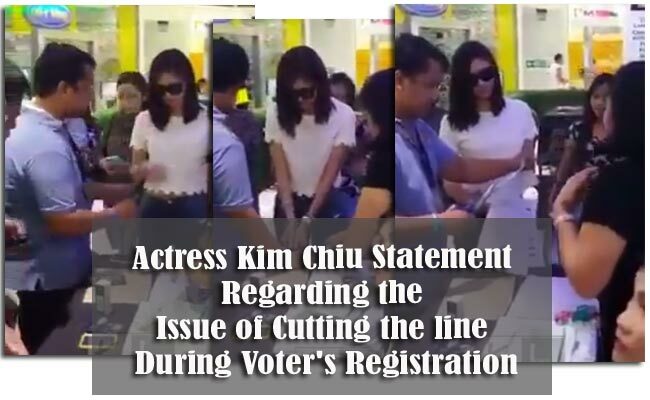 Kim Chiu defended herself after a Twitter follower asked her about the video that was circulating on Facebook showing her allegedly skipping the line of registrants. In the video posted by Facebook user, KupalLord, Kim Chui is seen signing her registration papers and attaching her thumb prints. A man who seemed irate said that she had cut the line and when someone told him that it was the actress he said he did not care who she is. The video was accompanied by a caption saying that the video shows the voter’s registration in Marikina. When the registration started, Kim Chiu had skipped the line. People were in line waiting for their turn. The complainant also accused the COMELEC for letting a celebrity cut the line. The man also asked the women behind the desk why they had let the actress register without following the procedure of lining up with the other registrants, but he was given with vague answers. The women said that they had opened their registration at 11am, but the man said that they were told that the registration starts at 8am. As a response, Kim Chiu said that her RM (Road Manager) was the one who actually lined up for her. She was actually at the site since 7:30 in the morning for the registration. When it was her turn for the registration, that was when she went out of her vehicle to register herself as a voter. She further posted that people should not easily judge what they see as the story could be very different. The video now has almost 2 million views with more than 39,000 likes and has been shared more than 38,000 times. Some netizens pointed out the a celebrity status does not give anyone the right to skip lines while some shared that it was fine if someone had actually lined up for Kim Chiu.